Ralph V. Gilles is an Haitian automobile designer, Born in the USA, Raised in Canada. 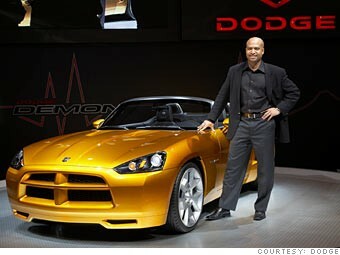 Ralph Gilles is the designer behind the Chrysler 300. Gilles was born in New York City to Haitian immigrants and raised in Montreal, Quebec. If the Haitian populace was not so quick to reject Haitians who live or were born in the U.S., maybe Haiti would have been a couple of steps ahead by now. There are a lot of Haitian Americans who have a love for Haiti. If someone was born in the USA, then he is an American and not Haitian. Haitian is not a race, but the nationality of those who were born on Haitian land Regardless of race or ethnicity. The Haitian constitution is very clear concerning the Haitian nationality. Please stop making false claim as though somebody with an with an American birth certificate would be considered Haitian. Am from P.R. Am ben living in CT all my life. I thing l got the best Designs SUV spot SS addiction .for 2020..l do not know what to do with it.l wil like to live it to Dodger company...if my best Design go an production ..what l will get?.l be happy with sport dodge car.wtby.CT.06704...203-510-0915.. I take my time to congratulate Mr Ralph Gilles because I am a Haitian immigrant to come to U .S.A. After graduate from Haiti law school. Can you guys stop saying he is an Haitian. He was born in the US and raised in Canada. the Haitian is the one who was born and raised in Haiti. How can I contact Mr. Gilles? I'd like to e-mail him about an experience I had at a Dodge dealership.